This past year, Housecall Providers hired its first advice (triage) nurse, Jessie Head, RN, to offer support to our primary care patients and team members. This service allows our patients and caregivers to receive a timely assessment over the phone when a sudden health issue arises. Jessie, who handles anywhere from 15 – 30 calls a day, is somewhat of a health care detective. Since losing 60 percent of her hearing to meningitis as a child, Jessie had to hone her listening skills to include not just the words she was hearing but the pauses and silence that surround them. 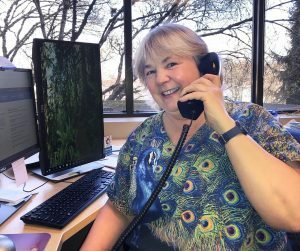 This ability she says has helped her so much as a telephone advice nurse because she is not just listening to the words; she is listening to everything within the conversation. “I’ve been called a psychic before, because I just know things that other people have not figured out. It’s not because I have a special power, it’s just that I pick up on cues,” says Jessie. Housecall Providers created this position out of the desire to offer the highest level of care. Patients and families who call in needing help with what Jessie terms the “nuts and bolts of health care”: getting equipment, prescriptions, referrals to specialists, and information about labs and X-rays are sent to their provider’s care coordinator for assistance. Those with an acute health concern are routed to her so she can interpret the information received and recommend a course of action. At times, the intervention might be providing education and more context about the patient’s condition so symptoms can be managed at home. Other times, she might determine it is necessary to involve the primary care provider (PCP) or another member of the care team. This screening allows our PCPs to respond to serious needs quicker because they have a team of nurses behind them to manage the prep work on an acute issue. This team-based care model allows the providers to work at the top of their license and have all the pertinent information necessary to make an accurate diagnosis and start the appropriate plan of care. “Sometimes, though, all that is needed is a listening ear, and I am happy to supply whatever our patients or caregivers might need in any given day,” says Jessie.